At the beginning of the year, a strange dog suddenly appeared at the Frankel home. Interviewer: Many people have claimed that it was in the kidnapping’s merit that the threat of the terror tunnels was discovered. The religious community of Nof Ayalon is quiet and calm. Brightly-colored roses by the entrance to the Frankel’s home hide an inexpensive basketball hoop which the brothers and sisters set up in Naftali’s memory. “This is their therapy,” their mother smiles. 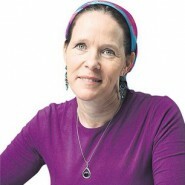 She is an effervescent busy bee, 45-years-old, a yoetset halacha who teaches gemara and halacha at women’s institutions such as “Nishmat” and “Matan.” She is a graduate of Nishmat’s program which has trained around 80 women to answer intimate questions related to the laws of family purity. Her husband Avi is a Chief Superintendent in the Israeli police, and they have brought to the world 7 children: their firstborn Tzvi Amitai (19), their second Naftali z”l, Ayala (14), Avigail (11), Noga (9), Naama (6), and Shlomo (4). Naama draws a picture of her brother in a notebook. “My teacher said that if I remember Naftali, I should simply write about him,” she tells me. Interviewer: What kind of relationship did you have? “He trusted me very much. But in our child- mother relationship, we were only in the initial stages of going to deeper places. This pains me so much, because the process of a teenager who was finding his place and opening up in a new way had only just begun, and we didn’t have the chance to go any further. “On that Thursday we received an SMS from him that he was on his way home. We said ‘great’, he’s a big boy, and we went to sleep early. We slept wonderfully, until 3:30 in the morning when the policemen knocked on our door. The She’ar family, which had been in touch with Gilad earlier that evening, saw that he hadn’t returned home and that his cellphone was turned off. They spoke with the yeshiva and they were told that Gilad had left with Naftali, and so the policemen came to us. It took them a long time to wake us up. I remember when we heard what they wanted, there was a moment that I said , ‘Whats’ the problem? He’s upstairs, asleep in his bed.’ Because Naftali was such a responsible kid and it didn’t make any sense that he hadn’t returned home. “We went upstairs and he wasn’t in his bed. We went down to the basement and he wasn’t there either, and only then did I understand that something terrible had happened. At first I thought maybe there had been a car accident. Avi works for the police and right away he began making phone calls. After that he and Ophir She’ar (the father of Gilad) went to the yeshiva in Gush Etsion. And they found out that the boys were in the area of Hebron. That was the flash point. That gave us a direction. Because a child who sets off for home in the area of Modiin and ends up in the Hebron area doesn’t leave many possibilities to the imagination. Morning came and the Frankels and She’ars still didn’t know about the 3rd kidnapped boy. “When the Yifrach family arrived at the police, they already knew to connect the dots. Rumors began flying around Whatsapp and the internet, and I requested that they speak with my oldest son who had slept in Jerusalem that night to tell him the few details we knew, because I didn’t want him to hear about Naftali from somebody else. I went over to my girls’ school. That morning a special event happened to be taking place, so I sat to the side and made sure that nobody would say anything to them about what had happened, and when we got home I told them myself. Interviewer: How did they react? Ayelet is big. She understood that the situation was serious, and became very upset and surrounded herself with friends and counselors from Bnei Akiva. The smaller children reacted in accordance with their level of understanding. When we arrived home there was already an emergency team and tons of journalists, but I felt completely focused. The tension accumulated in my lower back, but I was very stable and very much aware of what was going on. Interviewer: Did you believe that Naftali was alive? Everybody was extremely straight with us, from the Prime Minister to the Defense Minister to the representatives of the Secret Services, the IDF and the police. They told us that there had been a weapon in the car. That there had been shooting. But in the same breath they told us that it was possible that the shooting had been to scare them. More intelligence was collected about the kidnappers’ intention to keep them alive. So we were left with three possibilities: that the shooting killed the boys, that they were only injured, or that they were completely alive and well and that the shooting had been in order to force them to stay quiet. Interviewer: Did the fact that you are people of faith encourage you? That was a period that was very hectic and terrifying, but there were also elements of action. Everything was very intense, and maybe because of that, I don’t remember the period of uncertainty as traumatic. The trauma was when they discovered the boys. Before that, we were surrounded with incredible support systems. We were embraced from every possibly direction. Interviewer: How is your emotional state different today than it was right after the funeral? Unlike the initial period, now I find places for myself to let go and sob. I set that free, and I also tell myself that it’s not good to let the tension to kill me. I want to live it in a healthy way. Now everything is still at the beginning, but I said to myself that maybe I’ll start doing yoga, or swimming, or maybe even study belly dancing. Anything that will extinguish the longing for a few hours. My time now exists on a different plane. Life isn’t fully normal yet, also because Israel was at war, and also because there were many events surrounding the Shloshim. In September, the kids will go back to school, and we’ll begin to get to know our new lives. I’m new in this profession, but I understand that this is a story that goes on for your entire life. So I try not to go in the direction that will sap my energy. There was a meeting with the Secret Services because they arrested one of the people who planned the kidnapping, but I didn’t go. Avi went. But I wasn’t interested in going. It’s not important. It’s important that they take care of the kidnappers, but looking at their photos isn’t good for me. I don’t want to be in a place of anger. A reporter from FOX spoke about us on his program and asked where Racheli Frankel gets the strength to forgive the kidnappers. That’s incorrect. Are you kidding? I don’t forgive the murderers, but I differentiate between the Palestinian people and Hamas. There are times when looking at Naftali’s photos is simply torture. And there are times when it is magical for me to see him playing and happy. His friends from his school choir showed me a video in which he’s performing a solo, and I watched him singing and happy and suddenly it wasn’t torture, it was sweetness. You inspire me! This is ahavat Hashem! What a lovely and amazing woman. A true Eshet Chayil. She is truely a role model for every one of us. May Hashem give her from now on and forever only Nachas with her kids and heal her pain. I am in awe. She has such courage and emunah. May this year be filled with revealed blessings for all of us.